Three months removed from scoring in the World Cup final and still three months shy of his 20th birthday, Kylian Mbappe is already a serious title contender for the Ballon d’Or award as the best soccer player in the world. The Paris Saint-Germain striker helped his case over the weekend, becoming the youngest player in the past 45 seasons to score four goals in a single French league game. “The Ballon d’Or? Why not? 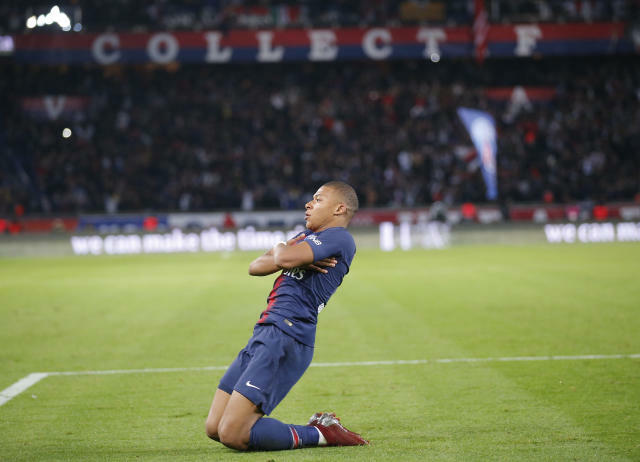 I don’t rule out anything,” Mbappe said after scoring his four goals in a 14-minute span on Sunday as PSG extended its unbeaten start to nine wins with a 5-0 rout of Lyon. With those latest goals, Mbappe is expected to be among the nominations for soccer’s biggest individual trophy when they are unveiled later Monday. Awarded every year by France Football magazine, the Ballon d’Or winner will be announced on Dec. 3. Mbappe, who won the best young player award at the World Cup in Russia after becoming the first teenager to score in a final since Pele in 1958, delivered his most efficient display since joining PSG against Lyon. After Neymar put the hosts in front from the penalty spot early in the game, Mbappe single-handedly won a fiercely-contested match at the Parc des Princes which saw both teams reduced to 10 men in the second half. With striker Edinson Cavani substituted by coach Thomas Tuchel following Presnel Kimpembe’s red card, Mbappe took the scoring responsibilities. He first missed a series of chances but finally scored PSG’s second goal in the 61st minute with a left-footed shot. The former Monaco player was then clinical: He made it 3-0 with simple tap in from Marquinhos’ cross in the 66th, completed a hat trick with a shot over goalkeeper Anthony Lopes in the 69th, and sealed PSG’s win from the rebound after Neymar had had a shot blocked in the 74th. “For me he’s a phenomenon. I hope it will continue like that for several years because football will thank him,” said Neymar, who joined PSG from Barcelona to flee from the shadow of Lionel Messi but could now be eclipsed by Mbappe. Following his four-goal showing, Mbappe is now tied for the French league scoring lead with eight goals, alongside Neymar. Neymar was out injured for a long spell last season and had a disappointing World Cup. He is not among the favorites for the Ballon d’Or. But Mbappe delivered breathtaking performances in Russia and has been consistent throughout the year. The only stain on his record so far this year is a red card — the second of his PSG career — he received during injury time on Sept. 1 in a 4-2 win at Nimes, which resulted in a three-game ban. That day, Mbappe reacted wildly to a challenge from behind, shoved his opponent angrily to the ground and had to be restrained by teammates. Mbappe has since made amends. Not yet the equal of Cristiano Ronaldo and Messi, who have shared the past 10 Ballon d’Or awards, the teenage wonder has a good chance to dethrone the pair in December despite the fierce competition from the likes of Luka Modric and Antoine Griezmann, who are also among the favorites.